Sanaz Harirchian, M.D. has recently earned recognition as one of Find Local Doctors’ Top Patient Rated Plastic Surgeons due to her superior patient reviews and high rankings as a Houston facial plastic surgeon. Find Local Doctors recognizes physicians whose actual patients have consistently left favorable remarks across multiple review sources throughout the year. Your plastic surgery results are only as good as the surgeon you choose. At our Houston practice, my patients measure my success, which means I’m incredibly honored to accept this recognition from Find Local Doctors, says Dr. Sanaz Harirchian. Dr. Sanaz Harirchian is a leading facial plastic surgeon who serves patients out of her state-of-the-art facility in Houston. As an Ivy-League educated, fellowship trained and board certified facial plastic surgeon, she leads her field in providing the most advanced cosmetic and reconstructive procedures for the face. Dr. Harirchian believes in integrating time-proven methods with innovative techniques to produce the most natural and sustainable results possible. It is the cutting-edge approach, minimal recovery and outstanding results of her plastic surgery services that has led so many of her patients to leave such favorable reviews. Find Local Doctors recognizes her excellence in facial plastic and reconstructive surgery based on the feedback from her actual patients across multiple online review sources this past year. Find Local Doctors is a trusted directory that allows patients to locate qualified and reputable physicians in their area using an easy-to-navigate website. Dr. Harirchian has undoubtedly earned the prestige of a Top Patient Rated Houston Facial Plastic Surgeon for 2017. Dr. Sanaz Harirchian’s facial plastic and reconstructive surgery practice in Houston offers a full menu of surgical and non-surgical procedures for the eyes, face, nose, and ears. Patients can take advantage of a number of advanced cosmetic surgeries to reverse the signs of aging, including minimal downtime facelifts, eye lifts, and complex rhinoplasty. In fact, Dr. Harirchian holds specialized training and skill as a rhinoplasty surgeon, with the ability to address all ethnic groups and improve both aesthetics and breathing function of the nose. Whether she is helping a patient turn back the hands of time or offering Mohs reconstruction after skin cancer removal, Dr. Harirchian believes in compassionate, patient-centered care and results that ultimately enhance one’s quality of life. “Your plastic surgery results are only as good as the surgeon you choose. At our Houston practice, my patients measure my success, which means I’m incredibly honored to accept this recognition from Find Local Doctors,” says Dr. Sanaz Harirchian. Sanaz Harirchian, M.D. serves patients from Houston Plastic Craniofacial & Sinus Surgery located at 9230 Katy Freeway in Houston, TX. Sanaz Harirchian, MD is an Ivy-League educated fellowship trained facial plastic surgeon in Houston. She graduated with a Bachelor’s degree in Biology from Brown University. She obtained her medical degree (MD) from the New York University School of Medicine. After a 5-year residency in Head & Neck Surgery at Rutgers she went on to complete a prestigious and highly coveted fellowship in Facial Plastic & Reconstructive Surgery at the University of Miami. Dr. Harirchian is board certified by the American Board of Otolaryngology Head & Neck Surgery and fellowship trained in Facial Plastic & Reconstructive Surgery. Her practice is dedicated to aesthetic and reconstructive surgery of the face, with a focus on advanced rhinoplasty, eyelid, and facelift surgery. 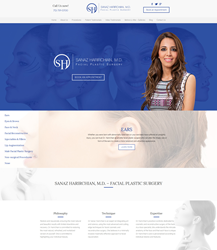 If you would like to get more information about the elite credentials or services of Dr. Sanaz Harirchian, please visit http://www.shfacialplastics.com or call (713) 791-0700.